Spooky Bonus is rated 4.7 out of 5 by 125. Rated 5 out of 5 by Landon2157 from Fun Match 3 called Spooky Bonus I have been playing this game for a few days now and I just LOVE it! It is simple, colorful and fun. The graphics are dark and spooky which adds a lot to the game. If you want to play a fun Halloween type match 3 game, check this one out. After all, for some of us, Halloween is NEVER over! Rated 5 out of 5 by Bumbles2 from I think they met my neighbor when they designed this game !!! Holy macaroni ...what a delightful game !!! I had a hard time leaving this game to do my daily chores !!! This game is a must have for all of you guys who enjoy Match 3's...its relaxing...and very addicting. The music is fabulous and definitely matches the theme of this game. Now as far as the artwork and graphics go....the artists went above and beyond on this game...they should be commended on the excellent job they did. This entire game is based on a Halloween spooky house. You have to earn points to buy the different scary stuff for your front lawn. I am so impressed with this game...its just so well done from start to finish...I just wish it was longer !!! i will definitely be playing this one again !!! Have fun all and try the demo...I think you'll have the same opinion as me...its an awesome game...trust me !!! Rated 5 out of 5 by navajoeyes2 from eeerrryyy sites This is a nice relaxing game. Semi challenging, many eerie places to visit, fabulous sounds for Halloween or any time. Wonderful wallpaper. Going thru the haunted places in your imagination and maybe your back yard. Love it, I played it many times over. 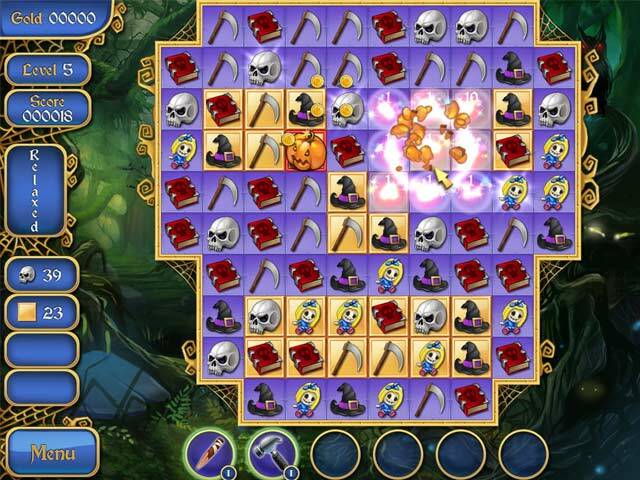 Rated 5 out of 5 by kerith90angel from Perfect Halloween Match 3 game.... If you like match 3 games they just don't get much better than this. What sets this one ABOVE most: 1. The haunted house you decorate: Your goal is to match and you obtain money and coins to buy Halloween decorations for your haunted house. The best thing is EVERY level of this game offers you a new item. 2. WALLPAPERS! This SE game actually gives you CE content for the same price. You can "set" the background of the M3 grid you are playing after a certain amount of play. By 12 spots of play in, you are offered 3 different ones plus the house you are decorating can be set. I love this genre and have played every demo of the match 3's offered here for years, by all the developers. I HIGHLY RECOMMEND THESE OTHER MATCH 3 HALLOWEEN GAMES. IF YOU LIKE THIS ONE TRY: 1. Save Halloween City of Witches ~~it is exactly like Spooky bonus except you don't get any wallpapers. 2. Queen's Garden: Halloween ~~You decorate a garden in this one and little trick or treaters walk the paths lit for night OR day. 3. Jewel Match: Twilight ~~You also get wallpapers in the SE here & decorate a scene for Halloween. And if you like Halloween Hidden Object games: Try this little jewel made in 2013- Shadows: Price of our sins To clarify graphics - as this is a 2013 game: Make sure to go into options first and change settings so there are black bars on either side. I believe you need to uncheck the widescreen box. Thank you BFG! Rated 5 out of 5 by melissa845 from Easier Match Three.... Enthusiasts can Play the timed version Lots of fun and one of the easier that I have played. The spooky parts are not scary nor macabre. Most of the witches are good witches, and the settings are pretty. Enough action to keep someone interested. A great beginner game in the non timed version. Rated 5 out of 5 by Kafinkee from I Love This Game! I'm a big fan of M3 games and this is one of my favourites. I'm playing it again for the Halloween season, play it at least once a year. Choose relaxed mode if you're in the mood for some relaxing, stress-free fun or play timed if you feel like a challenge (but man, level 100 is challenging both ways!). Plenty of reviews here outlining the game's features so I won't waste your time repeating them. I especially like how you can make very quick matches, one right after the other, bam/bam/bam. I can't think of a single negative thing to say about it. I highly recommend this game for both adults and kids. Rated 5 out of 5 by rpadder from I got my haunted house I love this game it is fun and challenging you can play relaxed or timed. great sound and graphics. 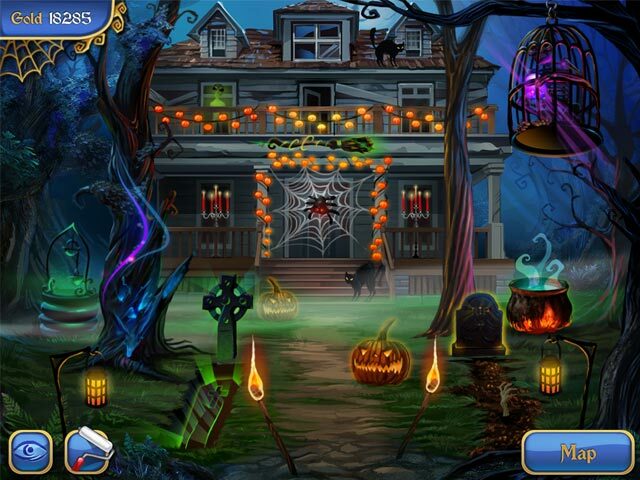 you win coins and buy things to decorate your home and win free prizes too to decorate your haunted home. This game is for everyone ,buy it is worth the money. 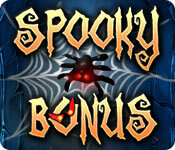 Rated 5 out of 5 by wildeman25 from Tripple Dog Dare Ya... to NOT... play "Spooky Bonus"! Well....Let me tell ya...I purchased this game for my kids which I feel is age appropriate for curtain climbers 8-10 years and up...And I do mean UP! I logged onto Big Fish to trial test this "KID" game and played until the trial time was up! While testing to perhaps purchase said game... my ten year old growls, "I want to play MOM! My response? "GO AWAY...I'M BEATING THE CLOCK!!" And the Scrooge in the house said, "Act your age, honey... not your shoe size for crying out loud! You're an adult...... all the while standing over my shoulder watching me master skills of hand and eye coordination I never knew I had. Spooky Bonus is entertaining and fun for us 40 somethings to take the stress away and get lost for a few hours or to keep your kids busy with good wholesome indoor fun. If you can pull yourself away long enough to fix dinner...you'll have to flip a coin for your turn to play again or just send the kids and husband outside to play in traffic... (Just kidding.........................kinda) You earn game cash from doing a job, "Well Done" to buy items for your "Spooky" house and yard in your "Spooky" little town that has "Spooky" little secrets to unlock. It is just simply silly kid fun. Purchase items such as coffins, evil looking pumpkins, black cats and anything related to "SPOOKY". Also earn free items for effort. The musical score is beautiful, intense and absolutely a joy to listen to. It fits perfectly with this game. 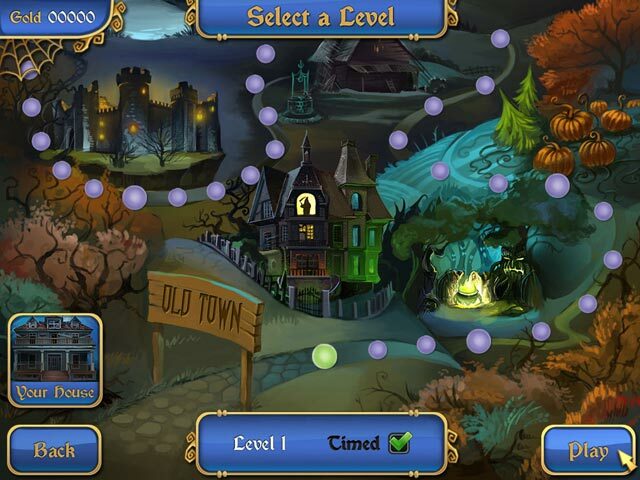 Graphics are artfully done and fun to look at as you unlock other story lines in your spooky town as you level up. You must keep a fast pace using your ninja swift skills matching three or more of scythes, black cats, ghosts and evil looking dolls and other delightfully spooky characters.... Master one level...go on to another. There is nothing that I do not like about this game. Five Stars All the way around. So....Go ahead! Act your shoe size! I Tripple Dog Dare Ya!